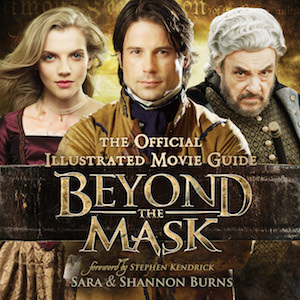 In this book, authors Sara and Shannon Burns detail the stories behind the Christian historical-fiction movie Beyond the Mask. The book is divided into 6 main sections: Secrets of the Past, The Production, The World of Beyond the Mask, A Colonial Cast, Masquerade, and The Studio. 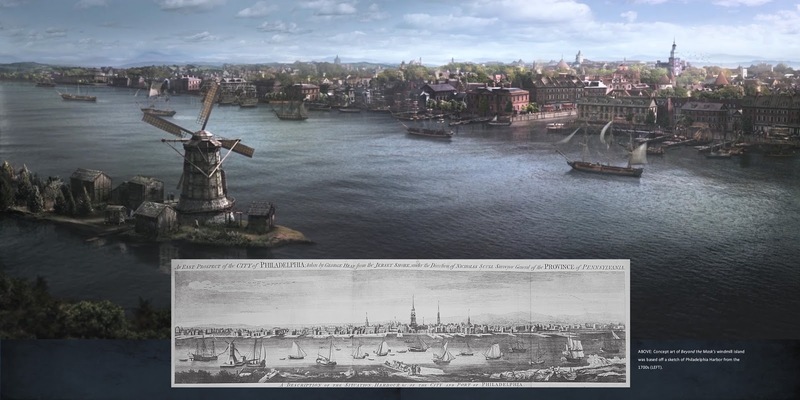 Because of its 1776 setting, history played an important part in Beyond the Mask, and “Secrets of the Past” details some of the true stories incorporated into the movie. 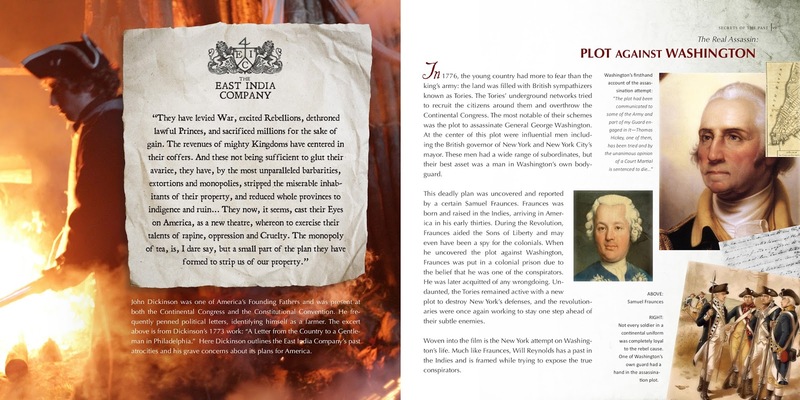 It discusses the East India Company, the assassination plot on Washington, Mr. Franklin’s experiments with electricity and even an island off Philadelphia known as Windmill Island. This section has an excellent blend of movie stills and original paintings to illustrate it. It ends with a piece by screenwriter Paul McCusker about his work in helping write the story. This section has graciously been shared by Burns Family Studios and is available at: http://beyondthemaskmovie.com/downloads. With the movie’s plotlines written, the next section “The Production” contains interviews with some of the key crew members like the director, producer, and composer. Each heads a different department responsible for a different piece of the movie. This section is lavishly illustrated with “behind-the-scenes” photographs, showing how a movie set actually looks. One entertaining picture shows a jump between two non-existent “rooftops” with a neon green panel as the background. Since Beyond the Mask is a historical-fiction movie, recreating the world of the 1770s is an important part of making the movie. In the section titled “The World of Beyond the Mask”, the authors describe and illustrate the process to create many sets. 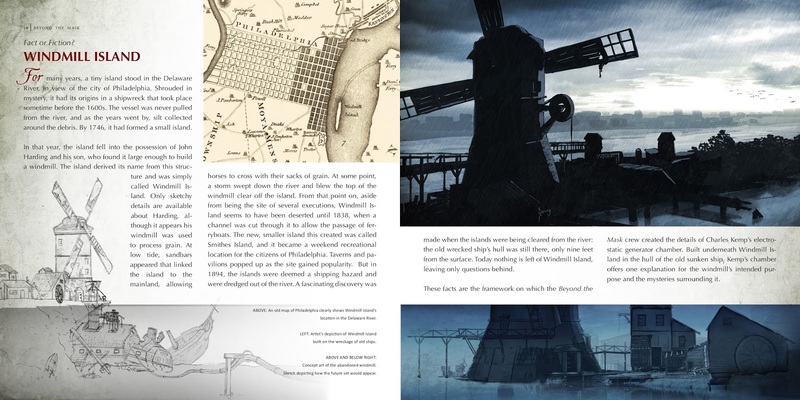 This section describes the creation of the Philadelphia street, the windmill, the ship and several other sets, whether physical or computer-generation. The pictures show the progress from concept sketches to finished movie scenes, and illustrate this section well. This is the most fascinating section to me, as I had the opportunity to help construct many of the sets shown, including the windmill, Philadelphia’s street, and the ship. In addition, I am in one of the photographs! This was an exciting find when I first paged through the book. If you would like to find me, I am on page 62, wearing an olive-drab coat and a gold-laced tricorne hat, while standing next to a man in white. Of course every movie needs actors, and the book’s next section describes some of them. Entitled “A Colonial Cast”, it begins with interviews with the casting director as well as the acting coach. William Reynolds is the hero of the movie, so his section comes first. 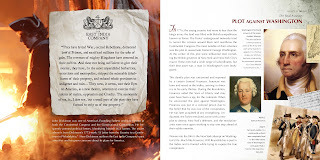 It is an interview with Andrew Cheney on how he relates to the character and the journey of William Reynolds. This section is illustrated mainly by groups of photos showing the various “masks” (identities) that this character wears throughout the movie. Beyond the Mask’s leading lady, Charlotte Holloway, is played by Kara Killmer (spelled with two L’s) and her section is next. It is mainly a narrative of her time on set with quotations from Miss Killmer. This section also contains an interview with the wardrobe designer and concept sketches for costumes. This book would be incomplete without a section on the movie’s villain Charles Kemp, played by John Rhys-Davies. This section describes his time on set as well as Mr. Rhys-Davies’ views on Western Civilization and the character of Charles Kemp. “I have no brother, I am like no brother…I am myself alone,” he quotes from Shakespeare’s King Henry the Sixth to describe his character. This section is illustrated by photographs and a description of Mr. Kemp’s elephant-headed cane. With the three main characters covered, the next several pages describe supporting characters such as Basil and Jeremiah Flack. The section “Masquerade” provides a good look at the many different pieces required to make a movie. Various departments such as Location, Wardrobe, Art, and Camera are all covered sequentially, that is, in the order they would be required to create the scene. Behind-the-scenes interviews with different people in each department, from set-dressing to catering, allow the reader to see just how much work goes into making a movie. Wrapping up the book are two short sections: “The Studio” and “Conclusion.” These two sections go hand-in-hand; the first shows how Burns Family Studios came into being and the second highlights the main message of Beyond the Mask: “It’s not what you do that defines you”. In conclusion: this book is an engaging, full-color look into movie-making and the world of Beyond the Mask. I would highly recommend it. 5/5 stars. Would you like to read this book after making it through my review? It can be purchased at http://burnsfamilystudios.com/store.html. Introducing Red Coats and Ruffles!